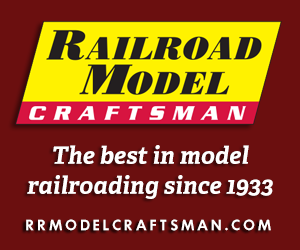 Each year, beginning with CTC Board Magazine and continuing with Railroads Illustrated, the readership is asked to take railroad photographs during one designated 24-hour period. The first such feature, called “A Day in the West,” occurred back in 1985 when the magazine was regional. As the magazine expanded its geographic scope, the feature expanded as well, becoming a Day in North America or “DINA.” Many readers are eager to know the date selected, often planning their vacations or other railfan adventures around DINA. This year’s annual is unique in that it features two Days in North America: May 23, 2015, and April 16, 2016. 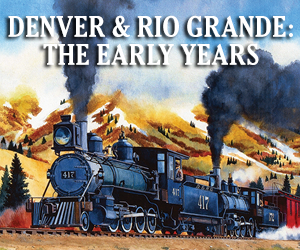 When White River Productions assumed Railfan & Railroad, Railroads Illustrated became an annual publication. The timing was such that the 2014 DINA had not yet been published, and therefore appeared in the 2015 annual. To keep the DINA consistent with the annual’s date, a one-time “catch-up” became necessary. As is always the case, we receive far too many terrific images to publish. It is a daunting task indeed to choose which images appear in the annual. The editorial staff agonizes over each decision to eliminate a photo for one reason or another. We can sometimes incorporate additional DINA images in areas other than the featured section, such as on the back cover and the editorial page as found in this edition. I selected the image accompanying this editorial from the 2015 DINA submissions. To me, all the elements of this photo embodied a “typical” Day in North America. A gentle breeze unfurls the American flag under a crystal-clear blue sky (the weather on DINA is unpredictable, adding to the challenge). 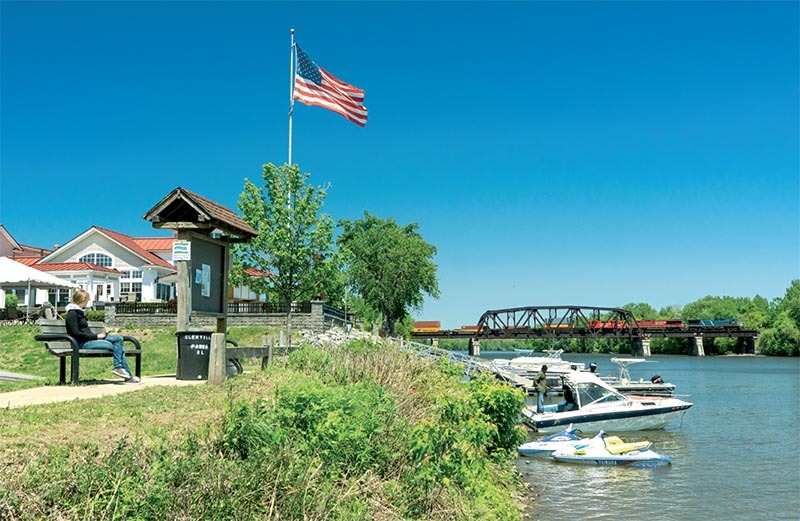 Pedestrians ready a boat to cruise the Mohawk River in New York State. Perhaps it’s a fishing date — their jackets and jeans suggest it’s too cold to ride those jet skis or go swimming today. In the background, a Canadian Pacific stack train crosses the river seemingly unnoticed. (It is unclear from this angle whether the young lady sitting on the park bench is watching the train, taking a brief pause from her digital world or merely contemplating what she just read.) Nowadays, it seems, railroads exist “behind the scenes.” In many instances, interfacing with the railroad has become more difficult since 9/11. The general public would prefer railroads not be seen or heard. However, most individuals don’t realize how railroads impact their daily lives. According to the Association of American Railroads, “Whenever Americans grow, eat, mine, make or buy something, it is likely that railroads were involved somewhere along the line.” Railroads are truly the backbone of the nation’s economy, working tirelessly 24/7 behind the scenes. The back cover image is from DINA 2016. It embodies contemporary railroading as well as pays homage to the industry’s rich history. Regional railroads like the privately owned Ohio-based Wheeling & Lake Erie account for approximately 31 percent of freight rail mileage in the United States, according to the AAR. W&LE’s corporate image, and subsequently its entire equipment roster, is reminiscent of Denver & Rio Grande Western’s black and Aspen Gold colors and “flying” letters. For someone like me, it harkens back to “vintage” railroading, when Zephyrs whisked eager passengers to far off vacation hotspots — part of the North American dream. DINA 2017 will be June 10, 2017. We welcome submissions for next year’s Railroads Illustrated Annual. The range of materials we regularly pursue includes operationsbased features, railfan photo essays, DINA, and a Portfolio. The deadline for DINA 2017 submissions is July 1, 2017. Contact the editor for submission guidelines.